NEW YORK, New York, September 24, 2012 (ENS) – Taking a page from Facebook engineers, researchers at Columbia University have developed new software that can calculate the carbon footprints of thousands of products simultaneously, a process that until now has been time consuming and expensive. A carbon footprint is an estimate of an activity’s total impact on climate change. Typically, a carbon footprint is calculated by estimating not only the amount of the greenhouse gas carbon dioxide that the activity emits, but also emissions of other greenhouse gases such as methane, nitrous oxide or refrigerants. All these impacts are added up and expressed as a single number, a carbon dioxide equivalent – the amount of CO2 that would create the same amount of warming. Getting an accurate carbon footprint for a product is a crucial first step for any company seeking to manage and reduce the climate change impact of its activities. The new software can help companies accurately label products and design ways to reduce their environmental impacts, says Christoph Meinrenken, the project’s leader and associate research scientist at Columbia University’s Earth Institute and Columbia Engineering. The project is the result of a collaboration between the institute’s Lenfest Center for Sustainable Energy and PepsiCo, Inc. Started in 2007, the project’s original goal was to evaluate and help standardize PepsiCo’s calculations of the amount of carbon dioxide emitted when a product is made, packaged, distributed and disposed of. 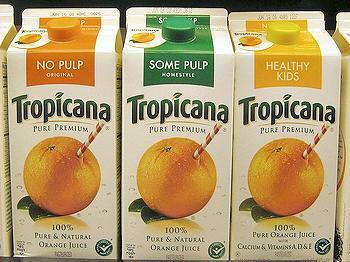 The project yielded the first U.S. carbon footprint label certified by an impartial third party, for Tropicana orange juice. PepsiCo has been pilot testing the method for other uses since 2011. Until now, life cycle analysis has been performed one product at a time, a process that requires lots of time and large numbers of personnel with specialized expertise, which few companies have. Aggregating data and calculations misses the microscopic level of detail a proper analysis requires. Meinrenken says he and his team were inspired by the work of Facebook data miners. “At companies like Facebook or Netflix, engineers employ statistical wizardry to mine vast datasets and essentially teach computers to predict, for instance, who will like a particular movie. For an environmental engineer, using such data to estimate how much the environment will ‘like’ certain products and services is especially rewarding,” he said. With this in mind, the Columbia scientists designed a life cycle analysis database to assess the environmental impact of 1,137 PepsiCo products. They developed techniques that together enable the calculation of thousands of carbon footprints within minutes, with minimal user input. The key component is a computer model that generates estimated emission factors for materials, eliminating manual mapping of a product’s ingredients and packaging materials. He said the software complies with guidelines sponsored by the nonprofit World Resources Institute, which provides standards against which carbon footprints can be audited. With this carbon footprint information, companies can design and assess ways to lessen the environmental impacts of their products and consumers will be able to make better informed choices. “Fast carbon footprinting is a great example of how academic methodologies with modern data processing and statistical tools can be brought to life and unlock their power in the real world,” said Klaus Lackner, director of the Lenfest Center for Sustainable Energy. Meinrenken and his team are now looking at applying these methods to other areas, such as water use.